We couldn’t have asked for better weather for the June 29-30 weekend of test pit digging in Shillington (Bedfordshire) with Shillington History Society, which is being funded by the Heritage Lottery Fund’s ‘All Our Stories’ programme and the Arts and Humanities Research Council (AHRC) and is one of the projects we are supporting through our Cambridge Community Heritage programme in 2013. The sun was particularly welcome after the rain on Friday put paid to many people’s plans to make an early start to the digging! The team involved in digging Test Pit 19 in Hillfoot Road, proudly arranged in and around their almost-completed excavation! Shillington is an interesting place, as it’s a village with a large number of ends, hinting at a complex developmental history and a previously much more dispersed layout than is the case today. It’s also very close to Pirton (Hertfordshire), where more than 100 test pits have been excavated since 2007 in a very fruitful collaboration between Access Cambridge Archaeology and the local community, so comparisons could be made between the two adjacent villages. A total of 20 pits were dug in Shillington over the weekend, adding to a handful more dug in the preceding week by residents away this weekend. More will be dug over the next week or so, with the total likely to nudge 30. Early analysis shows the results to be extremely intriguing. One pit (number 11) produced more prehistoric pottery than we have previously found in any test pit – from a single 10cm spit! There is clearly a prehistoric settlement here. Very little Roman material seems to be present in the Shillington pits, with one exception on the Meppershall Road where one sherd of Romano-British pottery came off the top of a cobbled floor or yard surface which may be associated with a building. Several pits produced late Anglo-Saxon pottery, and it will be interesting to map these to see if they concentrate in any particular areas of the village. Lots of the pits produced high medieval pottery (c. 1100-1350 AD), including several in Clawders Hill, Hillfoot End and Apsley End, showing these outlying parts of the village to be of early origin. Two pits nearest the church have not produced any medieval pottery, however (although one team are still digging so may yet find some! ), so it may be that this area was less densely occupied. Overall, Shillington in the Norman and Plantagenet era seems to have been thriving and densely populated, with a number of ‘end’ settlements arranged along roads to and from the church. 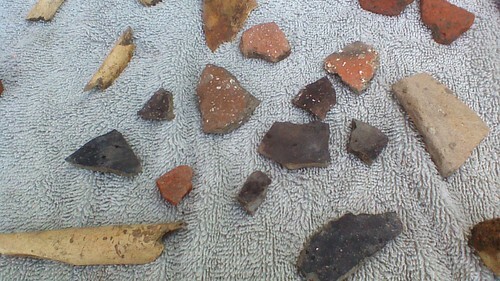 I suspect it will turn out to be well above average in terms of the volume of high medieval pottery recovered. In this, it would be very similar to Pirton, where s large number of pits produced high medieval pottery. In striking contrast, hardly any of the Shillington pits seem to have produced medieval pottery post-dating the 14th century – in fact, on present evidence, one could easily infer that just one household was left in the village after the Black Death and they spent most of their time in the pub! Although this obviously caricatures the situation, of course, it does seem as if Shillington was hit very hard by the successive set-backs of the 14th century. In this it again would be very similar to Pirton, where the packed high medieval settlement seems to have been utterly devastated in the later 14th century. At Shillington, based on the pottery evidence, recovery from the late medieval collapse does not seem to have been established until well into the post-medieval period. From more recent times some memorable finds included a candle-snuffer of probably 18th or 19th century date, a silver cross and a lovely enamel souvenir pin badge from Butlins in Clacton, dated 1957!! 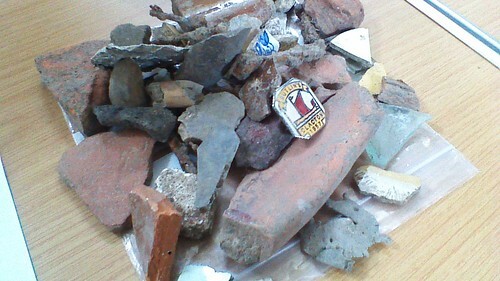 Finds from context 1 in Test Pit 4 in Church St, including post-medieval pottery and the Butlins holiday camp badge from 1957. 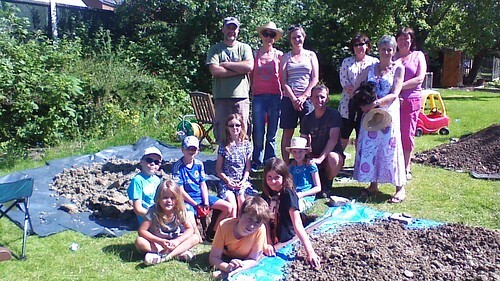 Well over 100 people took part in the weekend excavations at Shillington. Everyone seemed to enjoy it, and were impressed by the amount they found; most have also gained a new respect for the physical fitness of archaeologists they’ve seen digging on TV having tried digging for themselves! Participants spanned nine decades, and were treated to well-earned tea and a ‘hot off the trench’ upsum of the results from each pit at the end of Sunday afternoon. 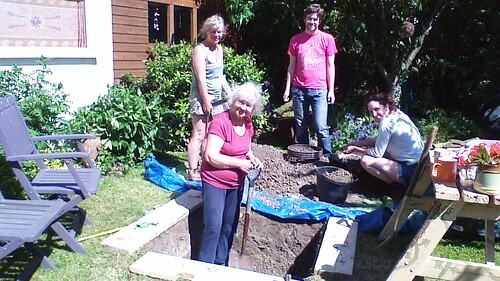 80 year-old Irene relishing the chance to wield a spade digging with her family in search of archaeological finds which included the candle-snuffer and may yet produce medieval pottery. Thanks are due to Shillington History Society and especially Derek Turner for all his hard work organising the project, and also to the HLF and the AHRC for providing funding. The results will be made available via the Access Cambridge Archaeology website as soon as possible.